The advertising broke on May 2, after going up early on a very small number of outdoor boards on April 29. 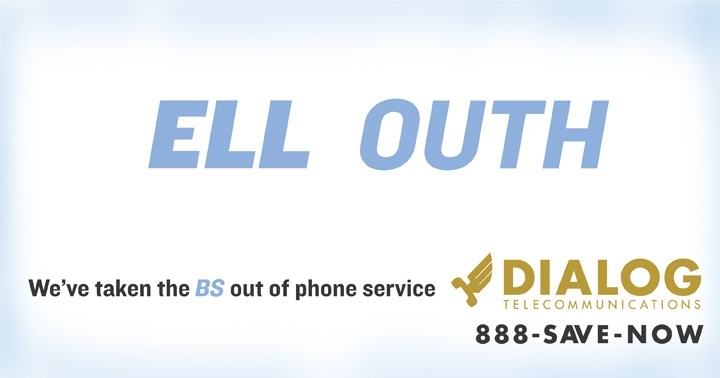 BellSouth issued its cease and desist on that same day, leading Dialog to suspect that its larger competitor had been informed of the campaign in advance. According to the BellSouth VP and general counsel, "This is the fastest that I've ever seen a reaction to anything like this. This came across my desk within days,the people upstairs are completely incensed." As is always the case with stunt marketing like this, Dialog Telecommunications has already receive far more than its money's worth on this one. Whatever else this ad is, it's not original. Remember the classic Jim Beam ad some years back? The one that said "ingle ells" ("The holidays aren't the same with J&B")? I'm sure whoever created the BellSouth campaign remembers it, too. Well, of course it's not original:-) Nothing is anymore. One thing's for certain: The client that bought this campaign has a gigantic set of balls. And that's no BS. I LOVE THAT AD! I switched from Bell South to Dialog over a year ago and have saved around $60 EVERY month on my phone bill since PLUS have the same service! You thinking of switching? Call 1.888.439.6100 and tell them Kathleen Cope referred ya! I will get $35 off my bill (which is my entire bill for 1 month-no matter what services I use the price never changes) and when you become a customer you can refer people too! The "ingle ells" ad was for J&B scotch, not Jim Beam. Which made the letters removed thing a great idea. The Late David Ogilvy's memory isn't what it used to be. Being dead will do that to you, I guess. My bad, Kenny G. You are, of course, correct: The original ad was for J&B, not Jim Beam. I bow before your superior knowledge of ad ephemera. But while my facts may have been confused, I stand by my contention that an agency as good as Boone/Oakley has no right to rip off a classic ad. oth re note ause tom cans fron. Oh no....the alphabet soup company is sueing me over letters. I must cease and desist using the letters....h, p, j, s, q, and of course sometimes y. Ive trademarked the word outh....somebody owes me money.